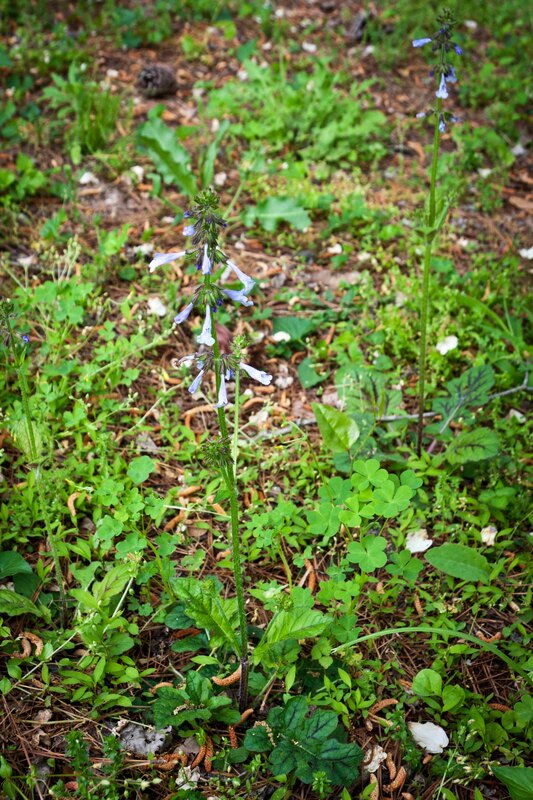 Lyreleaf Sage: Lovely Wildflower Groundcover — With Blooms! Flowers attract bees and hummingbirds. 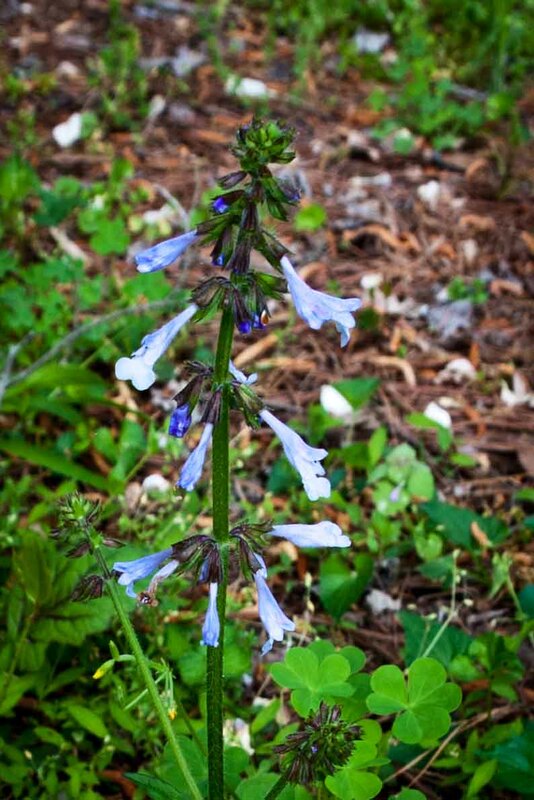 Lyreleaf Sage (Salvia lyrata) is blooming all over my yard at the moment. In fact, it’s blooming all over my area; I noticed several large stands thriving on a shady roadside near my house this morning. 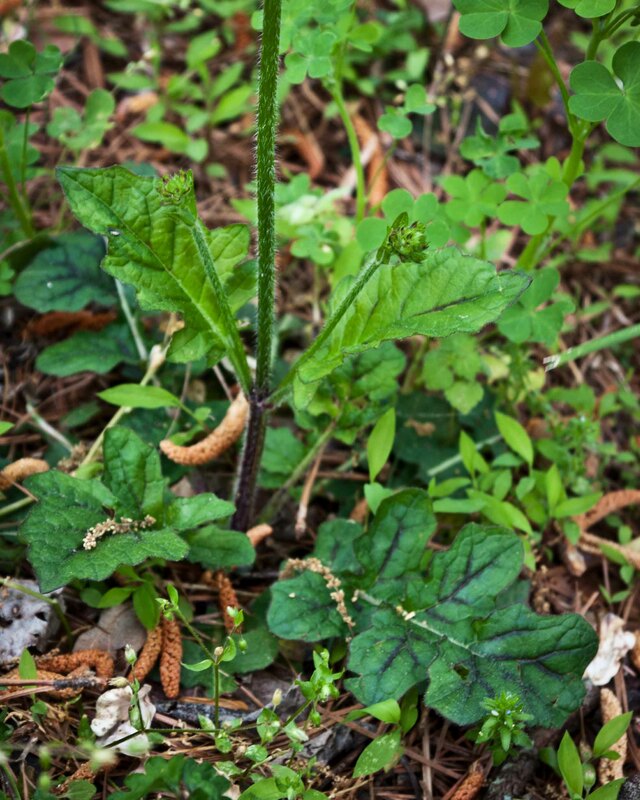 Another common name for this plant is Cancer Weed, because it has been thought by some to cure skin cancers; it’s still considered to be a cure for warts by many herbalists. One source I read said it was thought to cure cancer, because it spread vigorously — like a cancer — on the earth. But I think that’s overstating this native’s aggressive tendencies quite a bit. The lyre in its name refers to the shape of the evergreen basal rosette of leaves that someone decided resembled the shape of a lyre — a U-shaped instrument from ancient Greece. I don’t see the similarity myself, but the leaves are very distinctive, making it easy to identify this wildflower even when it’s not blooming. The reddish-purple vein color of the lobed leaves is diagnostic for this species. Although it is a member of the mint family, this common wildflower is not particularly fragrant, but the flower stalk does sport the square shape that characterizes this group of plants. Lyreleaf Sage grows and spreads on sandy and loamy soils; it’s not a fan of clay. It can tolerate deep shade to full sun, periodic flooding, and moderate drought. Some have recommended this native for use as a groundcover, comparing it to ajuga, and it certainly is as tough as ajuga — but not nearly as dense a spreader as far as I’ve seen. Odds are it’s either already growing or would happily grow in your Piedmont yard. Do you have a shady spot where grass won’t grow? Try establishing a patch of Lyreleaf Sage in your bare spot. You’ll have a year-round, attractive evergreen groundcover, and stately stalks of blue flowers every spring. Bloom stalks typically range between 1 and 2 feet. This entry was posted on April 16, 2012, 3:27 pm and is filed under Favorite Plants, piedmont gardening. You can follow any responses to this entry through RSS 2.0. You can leave a response, or trackback from your own site.